As trends such as digitization, Internet of Things (IoT), and Big Data have a major impact on the flow of global business, the role of power protection devices such as Uninterruptible Power Supplies (UPS) becomes more critical. Business work sites, whether they be factories, data centers, refineries or healthcare facilities rely on a steady stream of power to remain operational. Depending on the industry, millions of dollars of production can be lost for every hour of process systems downtime. UPSs are put in place to help avoid such power outage-related catastrophes. They serve as a bridge between utility power and generator power and aid in the smooth transition from one power source to another. 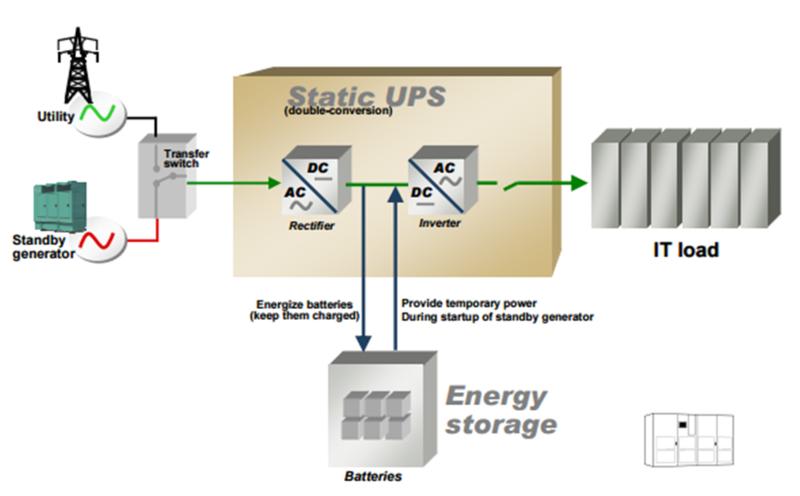 In the domain of large UPSs (i.e., over 500 kW) two principle UPS architectural categories exist (although within those categories there are many variations): static and rotary UPS. The static UPS is called “static” because, throughout its power path, it has no moving parts (although it has auxiliary moving parts, such as cooling fans). The rectifier inside of the static UPS converts the incoming utility AC current to DC, and the inverter converts DC back to clean sine-wave AC to supply the load. The DC current interfaces with the “energy storage” medium – most commonly batteries, in which case it charges the batteries and receives power from the batteries when the utility power supply is distorted or fails. The rotary UPS is called “rotary” because rotating components (such as a motor-generator) within the UPS are used to transfer power to the load. Rotary technology has been utilized for many years and came into prominence at a time when loads would commonly exhibit a low power factor (which resulted in increased losses in the power distribution system and thus, an increased energy cost) and high harmonics (which prematurely shortened the life of transformers and capacitors). Users would experience the dimming of lights, brought on by voltage dips and sags, when large motors turned on, for example. These load characteristics, in turn, would destabilize the electronics of connected loads within the electrical network. Thus, the introduction of the rotary UPS to address this issue. Rotary UPSs are more suited to environments characterized by multiple short inrushes of power. One such example would be an environment where multiple motors are constantly turning on and off. Satellite stations and broadcast stations where high power amplifiers turn on and off in rapid and random sequence are good examples of environments where rotary UPSs would be effective. Some rotary UPSs are also utilized for high security installations (e.g. military applications whose goal it is to prevent eavesdropping). Static UPSs are much more prolific than are rotary UPSs and service a much wider swath of applications. According to IMS Research (now IHS Markit), rotary UPSs represented only 4.3% of worldwide UPS revenues in 2008. The remaining 95.7% of the market consists of static UPS. Although there are many reasons for the dominant market presence of static UPS, two important drivers are installation costs and efficiency. On the installation side, static UPS systems are installed inside of a building while a significant percentage of rotary UPSs are installed either outside of the building or within a specially built enclosure. Static UPS topologies also run more efficiently than their rotary counterparts over the entire normal operating range with a very significant advantage below 50% load. Rotary UPSs sustain higher fixed losses. Examples of these rotary UPS fixed losses include the energy utilized to power controls, flywheels, and pony motors (small motors used temporarily to heat diesel to suitable starting temperatures) associated with the rotary UPS at zero load and the energy utilized to preheat the engine coolant and lubrication. Frictional and windage losses (resistance to rotation of the shaft) also have an impact on the overall efficiency. These losses are referred to as standby losses and they represent the amount of energy required to keep a motor running or to keep a flywheel spinning. To learn more about UPS architectural differences and the impact on applications, download the APC by Schneider Electric white paper #92 “Comparison of Static and Rotary UPS”.